The 1934 World Cup mixed sports and politics, as it was staged under the Fascist rule of Benito Mussolini in Italy. A regular spectator at Rome's Nazionale stadium during the second World Cup, Il Duce made the tournament his Berlin Olympics, using the competition to showcase Italy and trumpet his Fascist regime to the world, while at the same time uniting the country behind the national team. The inaugural World Cup proved to be such a success that invitations were not needed this time around. Thirty-two nations wanted to compete in Italy, so FIFA convened a qualifying round to reduce the field of aspirants to 16 teams. Relations between South America and Europe were fragile. Still upset by being snubbed four years earlier by the European teams, world champion Uruguay declined to participate, while Brazil and Argentina did not send its best players, choosing instead to field "B" teams. Only four of the 16 nations at the World Cup came from outside Europe. The World Cup also sported a new format. There was no opening group stage. Instead, the tournament was a knockout competition from the start: if you lost, you went home. Games went to extra time in case the teams were tied after 90 minutes, and a replay (another game) if they were tied after 120 minutes. There were no penalty shootouts. MATCH OF THE TOURNAMENT: Italy's 2-1 victory over Czechoslovakia in the final. A frantic opening 90 minutes saw the score even at 1-1. Both teams were exhausted, but Italy, supported by the Rome crowd, won in extra time on Angelo Schiavio's marvellous goal. MAN OF THE TOURNAMENT: Giuseppe Meazza. He wasn't even Italy's top scorer (Angelo Schiavio scored four times), but there was no doubting Meazza's influence. The Inter Milan forward scored two goals, including the winner against Spain in the quarter-finals. Playing injured in the final, he set up Schiavio's game-clincher against Czechoslovakia in extra time. SPOTLIGHT: Regarded as one of the greatest managers in soccer history, Vittorio Pozzo led Italy to two World Cups (1934 and 1938) and to the gold medal at the 1936 Berlin Olympics. Known as Il Vecchio Maestro - the Old Master, Pozzo was an iron-fisted authoritarian who demanded complete and utter commitment from his players. Pozzo was renowned for his tactical acumen, and is credited with establishing the twin pillars of Italian soccer: defensive strength and refined precision. Pozzo is the longest-serving manager of the Italian national team, recording an amazing 63 victories in 95 matches (both records) against only 15 losses from 1929-48. Pozzo died Dec. 21, 1968. He was 82. AND ANOTHER THING: Before FIFA tightened the rules, players were able to represent more than one country in the World Cup. During the 1930s, several of Argentina's biggest stars played in Serie A, the Italian first division. Vittorio Pozzo seized the opportunity and extended invitations to Raimundo Orsi, Enrique Guaita and Luis Monti - all born in Argentina, but with Italian roots - to play for the Azzurri in the 1934 World Cup. Although criticized by some, Pozzo defended his use of the oriundi (an Italian word to describe foreign-born national team members of Italian ancestry) by famously saying, "If they can die for Italy, they can play for Italy." It proved a wise decision: Orsi scored three times (including the tying goal in the final), Guaita netted the winner in the semifinals, and Monti proved a defensive dynamo in midfield. The festivities kicked off on May 27 with a bang. Italy crushed the United States 7-1 in Rome. Hungary defeated Egypt, the first African nation to compete at the World Cup, in Naples. Brazil and Argentina retreated home, 13,000 kilometres across the Atlantic, after losing to Spain and Sweden, respectively. The quarter-finals took place four days later, with Germany, Czechoslovakia and Austria advancing. Italy battled to a 1-1 draw with Spain in Florence under the hot Tuscan sun. Extra time settled nothing, the Italians unable to breach the steely Spanish resistance, so they replayed the game the next day. Both teams juggled their starting lineups - Italy made five changes, Spain seven. Forward Giuseppe Meazza's goal in the 12th minute stood up as the winner, and Italy booked a spot in the semifinals. 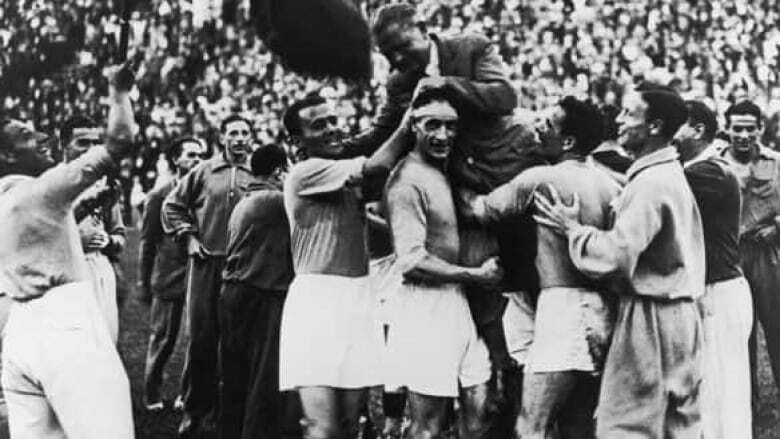 A Czechoslovakia-Italy final was set when the Czechs vanquished the Germans in Rome on June 3. Playing on a day's rest, Italy was still feeling the effects of the replay with Spain, but the hosts disposed of Austria's aging Wunderteam 1-0 on a rain-sodden pitch in Milan. Three days before the final, Ernest Lehner scored a mere 24 seconds into the contest to lead Germany to a 3-2 victory over Austria in the third-place game in Naples. All of Italy stood still on June 10 when Mussolini's Azzurri and Czechoslovakia clashed in the final in Rome. It was a matchup that pitted teams with different styles: the Czechs displaying great skill and style with their short-passing game, and the Italians showcasing their stamina and strength. Italy, of course, had the advantage of the home supporters. Both teams launched countless attacks, only to be thwarted. Finally, in the 70th minute came the breakthrough - winger Antonin Puc took a corner kick, and when the ball found its way back to him, he hammered it past Italian goalkeeper Giampiero Combi to make it 1-0 for the Czechs. Czechoslovakia should have put the game away minutes later, but Jiri Sobotka squandered a scoring chance and Frantisek Svoboda's shot slammed against the post. The Czechs paid for their poor finishing. With nine minutes left in regulation, Argentine-born Enrico Guaita, the goal-scoring hero for Italy against Austria, fed a pass to fellow Argentine Raimundo Orsi. The winger split the defence and beat Czech goalkeeper Frantisek Planicka with a right-footed curler after feigning with his left to tie it 1-1. Ninety minutes of furious action left both teams exhausted. Italy, though, was in far more trouble as the g ame went into extra time. Forward Angelo Schiavio looked tired in the waning minutes of regulation, while Meazza was limping. And yet, it was the Italians who broke the deadlock, conjuring a goal of pure magic in the 95th minute. The Czechs did not bother to mark the injured Meazza, and he made them rue that decision when he crossed to Guaita from the wing. Guaita passed to the tired Schiavio, who found open space after rounding Czech defender Josef Ctyroky and fired past Planicka. The Azzurri were crowned champions, ripping the World Cup away from the clutches of South America and giving Europe instant bragging rights. Critics contended the Italians only won because the tournament had been staged on their home soil. It was an argument Italy emphatically refuted four years later. Luis Monti is the only player to have played in two World Cup final games for two different countries. The tough-tackling midfielder appeared for Argentina in 1930 against Uruguay, and suited up for Italy in 1934 against Czechoslovakia. Uruguay remains the only reigning champion in World Cup history not to defend its title. Even though they were the hosts, Italy still had to qualify for the 1934 World Cup. The Italians thrashed Greece 4-0 in Milan in the first leg of a two-game playoff. The second game never took place as the Greeks withdrew. Referee Ivan Eklind was said to have met with Benito Mussolini prior to taking charge of Italy's semifinal and final games, leading many to believe the Swede made several disputed calls in the Italians' favour. The soccer stadium currently used by both AC Milan and Inter Milan is called Stadio Giuseppe Meazza, named after the Italian national team legend. The U.S. qualified for the 1934 World Cup by defeating Mexico 4-2 in Rome, a mere three days before the first game of the tournament.